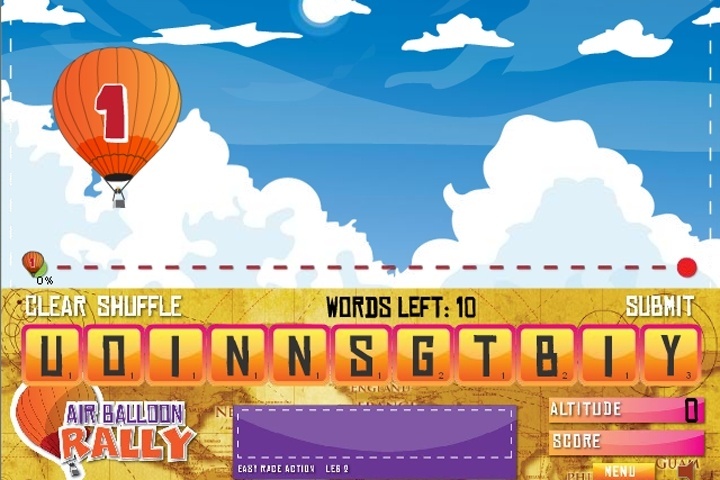 A very hard game of unscrambling words to make your air balloon win the race. Take a trip around the world. Fly from one country to the next. Type or click on letters to form words and move your balloon in front of the others. Use your Mouse or Keyboard to type in letters. Press Enter Key to submit. If you want to play Air Balloon Rally games online you have come to the right place! GamesLoon adds new Air Balloon Rally games every week. This is your game portal where you can find the biggest collection of free Air Balloon Rally games online. Do not forget to rate our Air Balloon Rally free online games while playing!